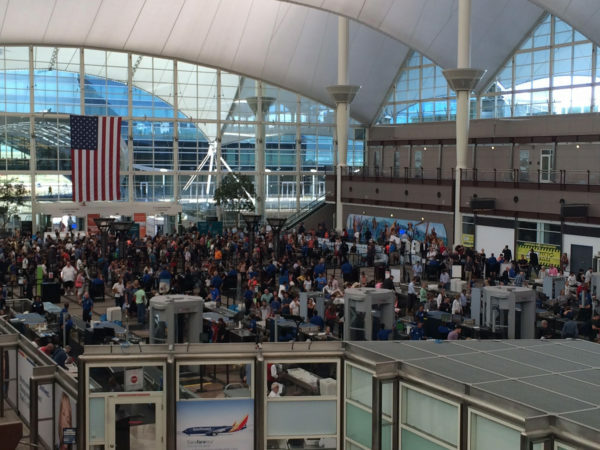 We skipped this crazy line at Denver International thanks to TSA PreCheck! If you read my first review of TSA PreCheck, you know that I was severely disappointed and declared it, on that trip at least, NOT worth it! We arrived at LaGuardia, which was the main reason we purchased TSA PreCheck, only to find there was no TSA PreCheck line. The regular line was not out of control, however, and we got through it in time, but we were really upset that what we thought we had paid for simply was not available — at a busy time of day too. So here is review No. 2. We flew out of Denver today and found TSA PreCheck to be immensely helpful. Check out the photo above of the CRAZY security line — and it even went further in the left side of the photo down a hall. I don’t know exactly how long that would have taken, but I’m guessing at least 45 minutes. We would still have made our flight, as we had an hour before boarding, but we were SO happy to skip that line. Instead, we went into the TSA PreCheck line and did not have to wait one moment. We walked right through, did not have to take off our shoes, remove our computers or liquids and zipped on to the gate. So this go-round was definitely worth it! Our next scheduled flight is to Orlando this fall and per previous Go to Travel Gal reader comments, TSA PreCheck is a big help there, as well. Where have you found TSA PreCheck to be helpful? And what airports did NOT have a TSA PreCheck line? We purchased TSA Pre-check. Our first use was at MHT (Manchester, NH). No problems there. On our flight home from MCO (Orlando), my spouse had TSA-Pre on their boarding pass, but I did not. I was not a happy camper at the time, because the “regular” lines were huge. I think if you pay for the service, you should get it every time. We will be flying to FLL (Fort Lauderdale)(the real reason we applied, as the lines have been extremely long – I’m talking hours – due to the cruise industry). Hopefully, we will both have it on our boarding passes when we take our return flight. Oh my gosh, I would be so mad if I paid for PreCheck and it didn’t show up on my boarding pass! You should call the airline and double check that they have your known traveler #. Good luck in Ft. Lauderdale! I’m based out of Denver and I’ve used my pre check to avoid long lines several times. But sometimes lines in Denver are very short, you just never know.